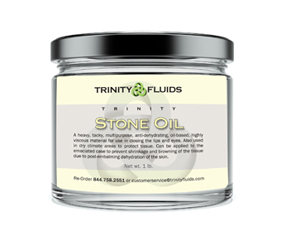 TrinityFluid’s Stone Oil is a heavy, tacky, multipurpose, anti-dehydrating, oil-based, highly viscous material for use in closing the lips and eyes. Also used in dry climate areas to protect tissue. Can be applied to the emaciated case to prevent shrinkage and browning of the tissue due to post-embalming dehydration of the skin.